It’s the morning of the 2018 Anthem Peachtree Junior and Ray, wearing bib number 258, is preparing for his big race. First, he warms up in the Clif Wrapper Grab booth, then moves on to a miniature slackline. Next up is a lesson in how to toss a foam javelin before heading off to tackle – in his own unique way – the hurdles. Ready for the main event, Ray lines up for the 50-meter dash and takes off, employing an arm motion more reminiscent of Michael Phelps than Usain Bolt. After crossing the finish line, he cools down on a playground slide and then stops to feed a duck whose face feathers match his new bright red race T-shirt. What quickly evolved into a celebration began three decades ago out of concern. In 1985, Julia Emmons directed her first AJC Peachtree Road Race after taking the helm as executive director of Atlanta Track Club. Afterward, she received a letter from a woman who asked if she realized that many of the children running were in tears by the time they reached Mile 5. She hadn’t. The next year, she ran the race to investigate, and what she saw matched the letter. Small children were struggling in a sea of giant adults, who in turn had to dodge the little ones. Thus, 32 years ago, the kids got their own Peachtree, separate from the adults, where they would be center stage. At the 2019 Anthem Peachtree Junior – for which registration is now under way – the children will move a step closer toward being part of the “grownup” Peachtree again, as the race moves to July 3 and ends at the same finish line as the next day’s AJC Peachtree Road Race. 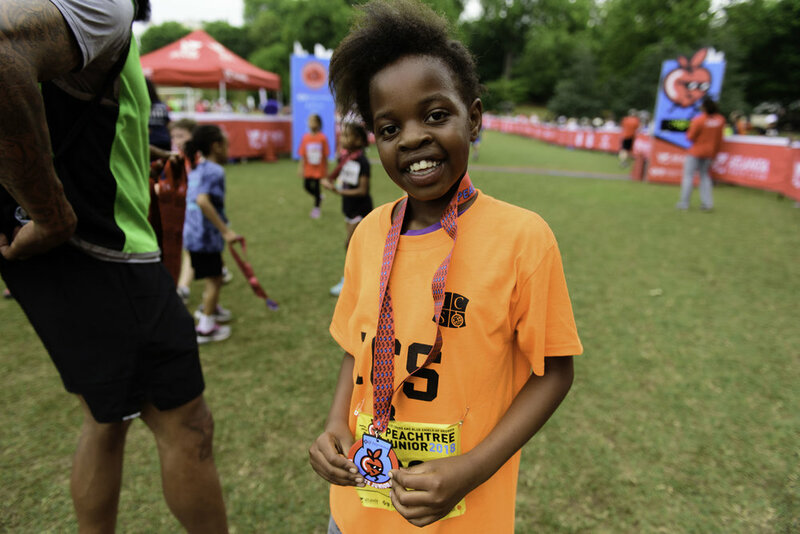 “As we celebrate all things Peachtree in its 50th year, it seems only appropriate to give these kids the same finish line and T-shirt experience that the adults will enjoy the next day,” said Kenah. The event will also be streamlined to a Mile (ages 6-14) and a Dash (ages 6 and under), in keeping with other Atlanta Track Club youth events. About 3,000 children are expected. Back in that first year, 600 children took part in the 3K. After receiving their numbers, they assembled behind signs labeled with their age. Organizers had expected the assembly process to take 20 minutes. It took two. “We had forgotten that kids are far better practiced at lining up than are adults,” Emmons wrote afterward. By the second year, 1,200 kids took part. By 1995, about 2,500 youngsters – divided into age groups – were running the 1.86 miles. Schools were conducting training programs even before Kilometer Kids was launched in 2007. Back then, and for most of the race’s history until recently, times were not kept and winners were neither announced nor recorded. Of course, not every kid was convinced. Jeff Glenn ran his first Peachtree Junior in the early 1990s. On July 4, young Jeff would help his mother at the Mile 4 water station, waiting for dad Gary to run past. When Jeff became old enough to run the Peachtree, mom lost her assistant. His father, now 64, still runs it every year, and Glenn does, too, when he’s in town. John Prevost, a member of Atlanta Track Club who has been volunteering at Peachtree Junior for at least 15 years, can’t hide the delight in his voice as he describes the scene at his water stop. Each year, schools involved in the Club’s Kilometer Kids program use Peachtree Junior as a goal in training. Two of the longest-serving and most-active coaches are Dawn Jones of International Community School and Ken Almon of Baldwin Elementary; each brought around 50 kids last year. “We’ve never gone and not had a blast,” said Almon. Both coaches extol the opportunity for their youngsters to get a chance to run with kids from other schools and other places, as well as the chance for them to meet Olympians: In recent years, the event has featured Olympic medalists such as Gail Devers, Dwight Phillips, Terrence Trammell, Chaunte Lowe and Adam Nelson helping introduce the young runners to disciplines such as the hurdles, long jump, high jump and shot put. Jones will often print photos taken on the day and post them on the school bulletin boards. The kids “love to see themselves,” said Jones. Almost as much as the grownups in the crowd love to see them.